This section shows a table of established and pending connections per backend. 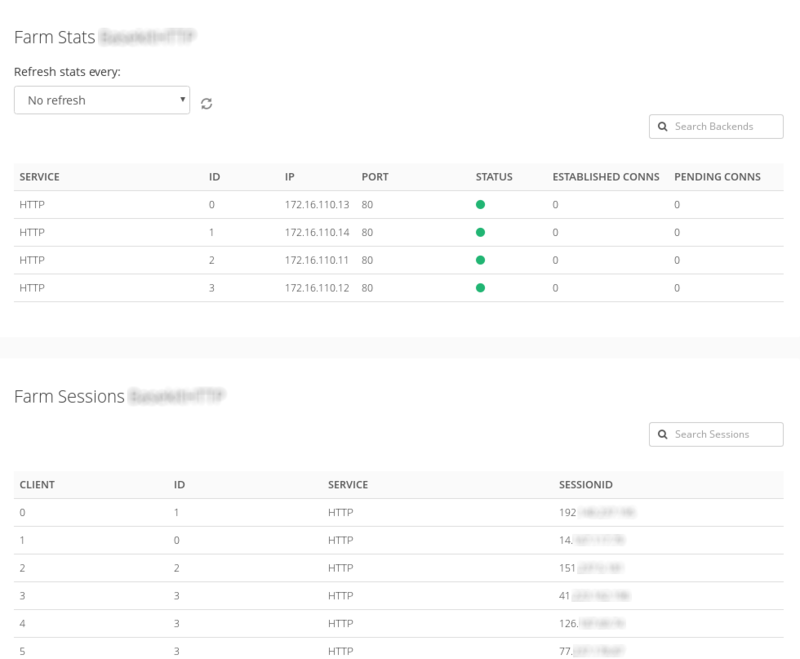 Also if the farm is an instance of a HTTP profile, an additional table will show listing the sessions established and showing the client IP and the backend serving the requests of such session. PORT. PORT of the backend. STATUS. Current status of the backend. ESTABLISHED CONNS. Number of current established connections to the given backend. PENDING CONNS. Number of current pending connections to the given backend. CLIENT. Client table sessions index. ID. Farm backend index associated to the client. SERVICE. Farm service name associated to the client session. SESSIONID. Client IP address associated with the backend. Gray bullet = When the farm is stopped and the backend is not on maintenance mode the real backend status remains unknown until the farm is started and the the check is executed.